I love this movie and I can't wait for my kids to see it! FANTASTIC!!! I love this movie. 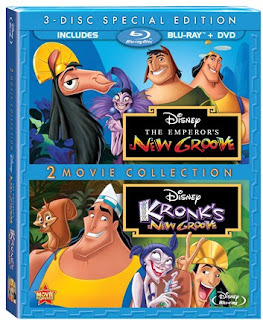 Will this release be the combo-pack ONLY, or will Emperor's New Groove be released on Blu-Ray by itself without a DVD or Digital copy. I'm personally hoping for the latter, because its all but impossible to find a movie on Blu-Ray WITHOUT any extraneous discs these days. The two-movie collection is a three-disc Blu-ray/DVD combo.